A hearty thank you to everyone who contributed during our winter fundraising campaign! Thanks to those who rounded up their bills at the bike shop, attended the Sneak Peek, donated online, and mailed in checks, we are within spitting distance of our $130,000 goal. The winter campaign is one of our two big, annual fundraisers. The money we raise during these campaigns funds everything we do – from providing bikes to kids at the Holiday Bike Drive to supporting Community Bike Educators at Hacienda and New Columbia to offering Bike Camp scholarships in the summer. 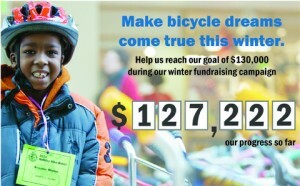 Our goal was to raise $130,000 between November 1st and December 31st – and we came so close. As of midnight on December 31st we had raised $124,597. Over the past two days, additional donations have trickled in bringing our total up to $127,222. We are amazed by the generosity of our community — you have helped us come so far. Happy new year, all! And thank you for supporting our work over the past eight weeks.